40% less vibration and a 30% reduction in tool exertion. Variable lock system makes bit replacement simple and offers multiple tool angles for chiseling. Internal double insulation technology, incorporated into the housing of the tool, greatly improves reliability and extends the tool life. Soft, non-slip Elastomer grip handle absorbs vibration and improves comfort and handling. Removable side D-handle, improves control and reduces vibration. STANDARD EQUIPMENT: Side handle, Injection molded carrying case, hex bar wrench, bull point. 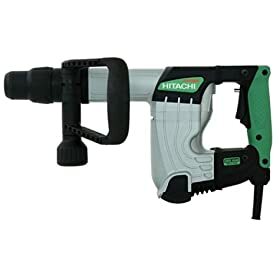 SPECIFICATIONS: 8.3 Amp motor, 950W power input, 9.2ft/lbs impact energy, 3000bpm impact rate, SDS Max chuck, VSR switch, 12-angles chisel rotation, 17-7/8" tool length. Bought this demo hammer 11/21/07. As expected, all Hitachi tools are true quality tools. Am goign to demo an entire driveway, which will be a good test of the tool's durability. Kind of a cheap jack hammer for the little guy. Not too happy with Amazon though. They advertise that this tool comes with case, tool, case, hex wrench, and grease. As shipped, no grease or hex wrench enclosed. Now have to find grease and tool on my own. Amazon as usual did a poor job shipping the tool. No packing cushion on bottom of box, so by time it got to me had a cracked case from some hard landings on trucks. Major hassle to get returned, so will keep and fix and buy stuff myself. Come on Amazon, do a better job of packing for shipment!!!! This hammer was perfect for my needs. I consider myself a good handyman. I am helping my wife's cousin build a 5K sq ft house. He put a window where we needed a door. The hammer went through six inches of reinforced concrete with 7/8 inch chisel. We scored the sides first with a diamond blade. It took up floor tile like a hot knife through butter. Used two inch scale chisel on tile three inch scale chisel on thin set. I had to hammer out concrete around a tub drain. Hammer is easy to use and control. My first demo hammer. I couldn't be more pleased. A very good demo hammer. After a full week of research I have decided on this demo drill and I am completely happy with my purchase. It goes through concrete with ease and the included chisel they give you is a nice touch. I am currently starting to demo a basement floor in a early 1900's house and so far it hasn't even broken a sweat. My only small compalaint is about the case. It feels a little flimsy and the tabs that close it are made of rubber. Overall a minor complaint. 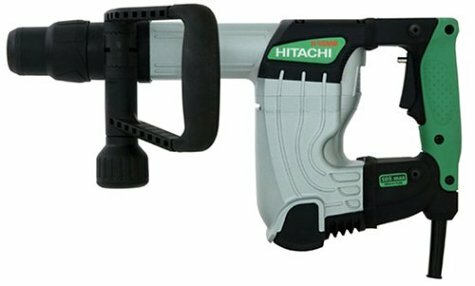 This is my first Hitachi product and if they make their other tools like this then this one won't be my last one from them. No real complaints. Its only been used on one job to tear out tile and it worked great. Hope it lasts a long time.